Johann Matthaei (Matheus) Wallreuther★ (1650± - ??) , Margarethe Schnock and Anna Maria Phumah(in)??? Johann Matthias Wallreuther was born no later than 1651 based on an age of 20 at the time of his marriage. He married twice. There were four known children from the first marriage. The oldest son, Johann Anton Wallreuther born 1673, became the Auxiliary Bishop of Worms in 1731 and died in 1734. A daughter, Marie Margarethe (1678), married Johann Bernard Kieser in Worms in 1708. J. Matthias Wallreuther had at least four children by his second wife. J. Christoph Wallreuther born 1686 married Anna Amelia Kieser, a sister of J. Bernard Kieser. J Christopher's son, Michael Anton Wallreuther (1711), had two sons who were priests in Worms: Peter Friedrich (1744) and Phillip Franz Ignacio (1751). Another son of Johann Christoph Wallreuther, Peter Fredrich (1712), was himself a priest. Johann Mattias Wallreuther was the Praetoris in Kiderich im Rheingau. Birth: No later than 1651 based on an age of 20 at the time of his marriage to Margarethe Schnock. Praetoris* in Kiderich (Kiedrich) im Rheingau, per marriage of his daughter Margarethe in 1708. *This is some sort of government admistrator concerned wth justice. Scabini at the birth of his son Simon in 1685. A scabini was some sort of official concerned with economic policy. Nassauische Annalen: Jahrbuch des Vereins für Nassauische Altertumskunde und Geschichtsforschung, Volume 104 lists Johann Matheus Wallreuther as an "Oberschultheissen". Bishop Wallreuther's grand-uncle, the brother of his grandfather, Johann Anton Schnock, was abbot of the famous monastery of Eberbach near Kiedrich. His name was Michael Schnock. Kloster Eberbach This convent was used in 1985 for the the interior-scenes of the movie "The Name of the Rose". *Bau- und Kunstdenkmaler des Regierungsbezirks Wiesbaden, Volume 1 By Ferdinand Luthmer, Wiesbaden (Germany : Regierungsbezirk). Bezirksverband, 1907, Harvard College Library Google Book and many others. *Joachim Specht suggests a spelling of Altvillam (or something similar) from Latin meaning Alta Villa the historic Latin name for Eltville. Note LDS Library has Eltville records starting in 1688. Information from the Internet - multiple sources: Bishop Johann Anton Wallreuther born May 25, 1673 Kiedrich, Germany died 1734, Ordained Mainz 1698, Auxiliary Bishop of Worms 5 March 1731, Titular Bishop of Sarepta 5 March 1731. Ordained Titular Bishop of Sarepta 22 Apr 1731 - died Worms 1734 - a priest for 35.8 years, bishop for 2.7 years. See Catholic Hierarchy for a list of the major religious events of his life. Johann Anton Wallreuther, a Wikipedia page created by Joachim Specht, includes information and images of the tomb of Johann Anton Wallreuter. He was buried in the Liebfrauenkirch Worms. According to the Wikipedia page Johann Anton Wallreuther graduated from the University of Mainz with a degree in theology. He was ordained on 15 March 1689. From about 1705 he was canon at the Liebfrauenstift Worms and was the parish administrator of St Johann (the baptistry of the cathedral) until 1711. In 1707 he graduated with a Doctor of Theology from Mainz. He was made Auxiliary Bishop* of Worms in 1731. He was also the titular bishop* of Sarepta. He died 16 January 1734 and was buried on 18 January in Johanneskirche where he had long served as chaplain. When that church was demolished in 1812 his tomb was transfered to the Liebfrauenkirch where it remains today. An auxiliary bishop, in the Roman Catholic Church, is an additional bishop assigned to a diocese because the diocesan bishop is unable to perform his functions, the diocese is so extensive that it requires more than one bishop to administer, or the diocese is attached to a royal or imperial office requiring the diocesan bishop's protracted presence at court. According to Canon law, no bishop can be ordained without title to a certain and distinct episcopal see which he governs either actually or potentially, therefore auxiliary bishops are titular bishops to sees that no longer exist. Titular bishops are those who have been appointed by the Holy See to a see or diocese which, in former times, had been canonically established and possessed cathedral church, clergy, and laity, but at present, on account of pagan occupation and government, has neither clergy nor people. A titular see in Phoenicia Prima, suffragan of Tyre. It is mentioned for the first time in the voyage of an Egyptian in the fourteenth century B.C. Sennacherib captured it in 701 B.C. None of its bishops are known. Some Latin bishops, but merely titulars, are mentioned after 1346. In 1185, the Greek monk Phocas (De locis sanctis, 7) found the town almost in its ancient condition; a century later, according to Burchard, it was in ruins and contained only seven or eight houses (Descriptio Terrae sanctae, II, 9). Today, Sarepta is known as Khirbet Sarfend, between Tyre and Sidon, on the seashore; the ruins show that the town extended 1800 metres north and south, but that it was not very wide. From 1732 to 1756 Franz Georg von Schönborn was the Prince-Bishop of Worms. See Franz Georg von Schönborn. A prince bishop was both a price and a bishop having secular rule over a territory as well as religious rule over a see. 1711: Johann Anton Wallreuther has something to do with the baptism of Michael Antonion Wallreuther, the son of Joahnn Christopher Wallreuther baptized in Herrnsheim in 1711. See below. 1705 to 1714: From 1705 to 1714 Johann Anton Wallreuther recorded all of the baptisms marriages and deaths in Johanneskirche Worms. **This was the Liebfrauenkirche, the church dedicated to the Blessed Virgin. Ritu Solemni consecratus fuit Wormatiae Anno 1731. die 22. Aprilis. Vir omni laude dignus, quem fata praepropera eripuere Anno 1734. die 16. Januarii. Hist. Worm. Tom. I N2 CAPUT CAPUT VI. The death record as entered in Johanneskirche. Thanks to Joachim Specht, September 2011, for help in deciphering the Latin inscription. Death of Margarethe Schnock Wallreuther: Anna Margarethe Wallreuther (word) wife of Joannis Matthias Wallreuther 18 August 1682. Son of Matthias based on marriage in 1710 in Worms. An ein Hochpreissliches Corpus Evangelicorum ... Vorstellung derer ... written in 1753 is a google book in German. The transliteration from the old script to modern German is problematic in that the transliteration program does not always see the letters and numbers as they were originally written. I can go back in and fix some of it but I am uncertain about much of it. The next problem is that I do not read German. To get the text into English I use Goodle translate which I think is a truly fabulous tool. However, it is not truly fabulous enough to give a perfect translation and there is quite a bit missing. Non-the-less I can get the general idea. The following, I believe, refers to Christopher Wallreuther. bis daher zwar richtig empfangen, Herrn colletor Wallreuter auch! über solchen Empfang alliährig völlig quiniret, dabeonebens aber das hochwürdi ge Stift St Andream über erstgemeldte 4 1/2. Malter auch und also alliährlich 4 1/4. Malter, mithin in gemeldten 23. Jahren 103 1/2. Malter mehr, als ich empfangen habe, quirmen mussen, so aber von denen bis daher dahier gestandenen Catholischen Schuldienern ebenfalls wird geschehen sehn, und ich damit es mir oder den Meinigen dermahleins nicht zum Nachtheil gereichen mdge, auf Begehren hiemit erinnern sollen und wollen. Rhein-Türkheim 15 Aug 1752. From memory?? Or in Remembrance?? Hence although properly received Collector Wallreuther also. Insinuating that the Collector Wallreuther favored the Catholics. In the Same book there is another reference to Christoph Wallreuther. In September 2011 Joachim Specht was kind enough to take a look at this reference to Christoph Wallreuther and say the following. It is a very old and circumstantial text, which refers to a juristic case about the relieving-officer of the village Herrnsheim. In former times it belonged to the Palatinate which was protestant (calvinist). So the relieving-officer was a protestant. In the time of your ancestor the village belonged politically to the small state of Baron Wolfgang Heribert von Dalberg Wolfgand Heribert Von Dalberg who patronized the poet Friedrich Schiller and was the brother of the last Bishop of Worms, Karl Theodor von Dalberg Karl Theodor Von Dalberg In that time the religion of the government was catholic and your ancestor Christoph Wallreuther was the government relieving-officer (Almosenpfleger) of Baron (Freyherr or today Freiherr) Wolfgang Heribert von Dalberg. He had to care for catholics and protestants as well, but the protestants didn't trust him and wanted a relieving-officer of their own religion and substantiated that with a lot of reasons. That is what the text says. So your ancestor Christoph Wallreuther was state-servant and relieving-officer of Baron Wolfgang Heribert von Dalberg. Recess nahmens des Almosens eingebracht wurde, welchen der Johannes Burger nicht, sondern Christoph Wallreuter zu Herrnsheim Freyherrl Dalbergischer Jurisdiction wohnhaft, mit dem ohnbeschienenen praedicato subsigniret, das er Almosen. Pfleger und zwar sowohl vor die Catholischen als Reformirten seye, welches letztere die der reformirten Religion zugethane, in wenig Personen bestehende Glieder, in Angst, Furcht und Schreckendeswegen gesetzet, weilen nach dem Churpfälziscken edicto d. 26 October 1698 die paritas religionis in der ganzen Pfalz beliebet worden, zu welcher Zeit das Ort Neuhausen Churpfälzisch gewesen, und dann Chur. Pfalz per edictum ulteriu de 5. Jun. 1599. ausdrücklich verordnet, dass das von unterschieden en Religions Berwandten communiter besessene Almosen, auch von Personen, so der Theil habenden Religion zugethan sind, administriret werden solle, dazumahlen reformati jederzeit einen Almosen. Pfleger ihrer Regilion zu Neuhausen gehabt, und nunmehro aus solcher Wallreucherischen Unterschrift offentlich erschienen, dass Dominicatholicii sich ohngescheuet anmassen, die retormaros Neukusanos pene exstirpatos um dieses edle Kleinod herum zu bringen, da doch in dem zwischen Chur Pfalz und dem Fürstenthum Worms an. 1706. errichteten Transact ausdrücklich stehet, dass der starus religionis in Statu quo verbleiben, und das reformirte Religions - exercirium gleichwie das Catholische erhalten werden solle. Recess introduced the almsman not Johannes Burger but Christoph Wallreuter from Herrnsheim the jurisdiction of Freyherrl Dalberger ................. in fear and fright because .... after being Chur-pfälziscken* edicto d. 26 October 1698...... and more popular was the "paritas religionis" throughout the Palatinate, at which time the City of Neuhausen Chur-pfälzisch been, ....... Palatinate by Edict ulteriu de 5th Jun. 1599th specifically directed that the distinction of religion en Berwandten communities obsessed alms, and by persons, then the part of wealthy religion than are delivered, are administriret should, at any time to grind "reformatie" charity. Their "carers" Religion Neuhausen had to, and from such ..... Wallreucherischen signature appeared publicly that Dominicatholicii arrogate to himself the retormaros Neukusanos pene exstirpatos to this noble jewel around to to bring it in because of the Chur Pfalz und dem Fürstenthum Worms ( principality of Worms) year 1706. Transact stands erected expressly that in the Status religionis, Statu quo remain, and the reformed religion - just as the exercirium Catholics ought to be preserved. Occupation: Michael Anton Wallreuther (1711) served as chancellor of the secular government of the diocese of Worms. Joachim Specht Wikipedia, 2011. "pronobilis et consultissimi domini Michaelis Antonus Wallrether judici aulici assessoris" at the birth of his daughter in 1737. I did not find it in either Martinskirche or Pauluskirche, Worms. There is a ✟ at the bottom of this entry which indicates the death of one or both these children. See University of Heidelberg below. Pauluskirche page 178, witness Dni Johanne Philippe Carocho?? of Abenheim?? Pauluskirche - hard to read, witness Maria Margarethe Michelin more. The microfilm dose not have complete records through the end of 1751 and a new libro starts with 1752. In August 2011 Joachim Specht, a German interested in the history of the Catholic Church in Germany, informed me that Phillip Franz Ignacio Wallreuther was a priest at St. Paul's in Worms. *PETRO FRANCISCO SCHWAAN, Ss.Theol. & U.J.Doctore, acque in hac Alma Universitate Jur. Eccles. P p. & o., Facult Jurid. Adsessore CAROLUS FRIDERICUS HEYL, BAMBERGENSIS, Bambergae, Inauditorio Juridico, Die a8. Junii, Anno 1774. Other Wallreuthers from this family were at Heidelberg. See Heidelberg University below. 1874, Collegiatstifter zu Worms Collegiatstift as St. Paulum Apstolum Probst Vacat Kapitularen (among four people listed) Hr Philip Franz Wallreuther. Kurmainzischer Hof- und Staats-Kalender: auf d. Jahr. By Erzstift (Mainz), 1874. By 1802 the chapter of the Church of St Paul had only five members. Towards the end of 1802 only three of the canons still resided at the parish of St. Paul in Worms: the former curator Emerich Haussmann age 67, the former cantor of the church "Philipp Wallreuter" age 51, and the former canon Jakob Stassen born 27 January 1763 at Lorch am Rhein and in the parish since 1799. So stand die Kirche und das Stift, bis die französische Revolution in den vielhundert jährigen Rechtsbestand und in den gemessenen Gang der alten Lebensgewohnheiten plötzlich und schonungslos eingriff. Durch Dekret des französischen Konsuln vom 9 Juni l802 wurden alle Klöster und Stifter aufgehoben und sämmtliches Kirchenvermögen vom Staate eingezogen. Un die Mittheilung dieser Massregel knüpfte sich die sofortige Beschlagnahme alles beweglichen und unbeweglichen Dermögens; den diesseits Gebornen wurde eine lebenslängliche Rente von 500 Franken, den jenseitig Gebornen nur ein Reisegeld von 150 Franken ange wiesen. Das Kapitel von St. Paul bestand damals nur aus fünf Mitgliedern. Gegen Schluss des Jahres 1802 hatten drei der Stiftsherren noch ihren Aufenthalt in der Stadt worms; sie lebten im Bezirk der Pfarrei St. Paul. Es war der ehemalige Kustos Emerich Haussann, damals 67 Jahre, der frühere Kantor des stiftes Philipp Wallreuter, 51 Jahre; der einstige Kanonikus Jakob Stafsen, geb. 27. Januar 1763 zu lorch am Rhein versah freiwillig seit 1799 die Pfarrei. Er hatte in Mainz seine klassische und theologische Vorbildung erhalten, bekleidete bis zur Aufhebung 9 Jahre ein Kanonikat bei St. Paul und 17 Jahre eine Professur am fürstbischöflichen Gymnasium zu Worms. Such was the church and the monastery in the many hundreds of years of legal existence and in the measured response of the old habits until the French Revolution suddenly and relentlessly intruded. By decree of the French consuls of 9 June l802 monasteries were abolished and all donors and all the church property confiscated by the state. ... the communication of this mass control was tied to the immediate seizure of all movable and immovable "Derm�gens"; on this side there arose a life annuity of 500 francs, the "otherworldly" arose travel allowance of of just 150 francs. The chapter of St. Paul at the time consisted of only five members. An at the end of 1801 only three of the members lived in Worms. they lived in the district of the parish of St. Paul. They were: the former curator Emerich Haussan, then 67 years, the former cantor of the church Philipp Wallreuther, 51 years, the former canon Jacob Stafsen, b. 27 January 1763 to Lorch on the Rhine since 1799, the parish knew him voluntarily. He and received his classical theological training in Mainz. and for 9 years until the repeal was the canon at at St. Paul and for 17 years a professor at fürstbischöflichen (Prince-Bishop) High School in Worms. According to Geschichte Dominikanerkloster St. Paulus St Pauls was a collegiate church. Secularization starting in 1797 diminished the spiritual life of the Monastery at St Paul. The Monastery itself was desecrated. For decades it was used a storage shed. In the 1880s it was a museum. It is now a Dominican school for training novices. Note: No Wallreuther deaths recorded in Pauluskirche between 1737 and 1773. Wallreuter marriages between 1752 and 1794 in Pauluskirche. Further Records: Based on the 1777 marriage of Marie Anne to Jacobus Breidenbach, Peter Fredich appears to have been in the clergy. See below. In August 2011 Joachim Specht, a German interested in Church History, sent me the connection to one of his pages which is about Peter Friedrich Wallreuther. See Peter Friedrich Wallreuther. The page includes images of the tomb of Peter Friedrich Wallreuther in St Martins Church in Worms. Joachim Specht states that Peter Friedrich Wallreutherwas a Catholic priest, canon and dean of St. Martinsstiftes in Worms. The following is loosely translated from Joachim's page. The Wallreuthers were a middle class family from Kiedrich in Rheingau, where his grandfather, Johann Matthaus Wallreuther, served as kurmainzer Chief Magistrate. Peter Friedrich Wallreuther was the son of Christopher Wallreuther of Kiedrich and Anna Amalia Kieser from Worms. They were married in Worms in 1710. Johann Christopher Wallreuther's brother (1673-1734) was a priest in the diocese of Worms and in 1731 he was made auxiliary bishop. Peter Frederick Wallreuther studied theology at the University of Heidelberg, where he appears in 1731 in the registers. He was ordained before 1734, he was listed in the Mainz court calendar of 1784 as having been a priest for 50 years. Wallreuther was a canon at the Martinsstift in Worms and served there as dean from 1776 until his death in 1786. The dean was the head of the collegiate. According to the grave inscription he was also pastor of the parish Lambertus incorporated church. He was buried in the abbey church of St. Martin of Worms. 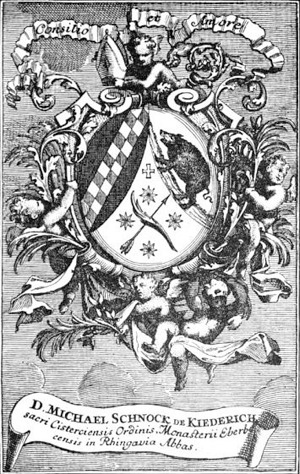 The coat of arms depicted on it carries a five-pointed coronet - it would appear that Dean Wallreuther and his family probably had been knighted. The older brother of Peter Friedrich, Michael Anton Wallreuther(1711), was Chancellor of the secular government of the diocese of Worms. His two sons, Peter Friedrich (1744-1814) and Philipp Franz Ignaz (1751-1811) were also priests. The former was worked from 1782 to 1802, the last dean of the Notre Dame monastery in Worms. Philipp Franz Ignaz was cantor at St. Paul. Descriptions of the St Martin Church Worms. Witness: Maria Margarethe Fehlman of Joannes Fehlman and Maria Elizabetha April 1735 (no day) witness virgini Maria Margarethe Wallreuther daughter of D Christopher Wallreuter Decemal et eclessia hujatis p.t. Children: Christopher 1(1744), Michael Anton 2(1745), Richard (1747), Maria Francisca3(1748), Maria Margarethe 4 (1749), Anna Maria (1751), J. Christopher1 (1752) Maria Francisca* 3(1753), Peter (1756), Anna Maria (1757), Maria Elizabethe 4(1759), Francisco Anton (1761) and Catherine Francisca (1763). Some of the children died and subsequent children were given the same names. Note: It is possible that some of the children were named after relatives: Christopher1 after Maria Margarethe's father, Michael Anton2 after her brother, Maria Francisca3 after her sister, Maria Margareth4 after herself. Maria Elizabeth 5 after his sister. Maria Anna Wallreuther of Christopher and Margarethe nata 8 September baptized 10 September witness Marie Anna Blesen daughter of Domini Wilhelm Blesen "calleary" m Abenheim mibjsae, Her-my cratoris Seperconrir (?) 10 September 1726 (Herrnsheim Parish Records) - (Listed on IGI) Had a cross next to her name with indicates a death no date. Note: Maria Francisca was only 7 years old in 1744. Death of Johann Matthias Wallreuther: Before 1708 when he was listed as deceased at the marriage of his daughter. The following references were made to Wallreuther at Heidelberg. Johann Michael Wallreuther was born circa 1707 based on the fact that the rest of the Wallreuters whose births are know and who went to Hiedelberg were listed at about age 18. Same as Johann Michael above?? Peter Frederick born 1712, son of Christopher. I do not know who Philp was. Born circa 1715. Son of Michael Anton Wallreuther born 1744. Son of Michael Anton Wallreuther born 1751. May be Michael Anton son of Christopher born 1711; he would have been 19 years old in 1730. Anselm Franz Joseph Ernst (and others) authored multiple tracts in Latin in the 1730s. He was a professor in Mainz. Several of the publications are listed as dissertations and it is likely that they were written by the students with the professor being the first author. Anton Michael Wallreuther died in 1831. Der Reichskanm1ergerichts-Sekretar A. M. Wallreuther ist gestorben nach dem Verzeichniss der beim Reichskammergericht gestorbenen Personen am 17. Mai 1831 (dort wird er als Notar bezeichnet), nach einer anderen Notiz hinter seiner Silhouette, die zufällig in des Verfassers Besitz gelangte, am 7. Mai desselben Jahres. Wigand arbeitete bereits seit 1830 an der Ordnung des Reichskammergerichts-Archivs in Wetzlar. Finis coronat opus. Novissimum hoc Repertorium, continens ter mille folia, perfectum per syngrapham solumodum (!) Ant. Mich. Wallreuther, Judicii Imperialis praeteriti1 Secretarii. 1817." Dass der Abschluss dieses Repertoriums im J. 1817, also erst unter preussischer Herrschaft erfolgt sei, darf man Wallreuther immerhin glauben, dass Wallreuther aber das Verzeichniss ganz allein gemacht habe, ist bei dem ausserordentlichen Umfange der Arbeit: alphabetische Ordnung und Regestirung von 76908 Prozessen nicht wohl anzuehmen, zumal Wigand, der eine ganze Reihe von Beamten des Reichskammergerichtes, darunter auch den A. M. Wallreuther, personlich gekannt hat2, ausdrucklich sagt, das Verzeichniss sei angefertigt von dern Subalternpersonal des aufgelosten Gerichtes"
Ueber die Auflosung des Reichskammergerichts hat ein Manuskript des Konigl. Staatsarchivs zu Wetzlar, das Verzeichniss der beim Reichskammergericht verstorbenen Personen, eine durch Fassung und Ort der Eintragung merkwürdige Notiz. Darin steht zwischen dem Vermerke uber den Tod des Kammerboten Kremer (1805, Nov. 1.) und über den des Kanzleidieners Kirchner (1811, Febr. 2.) folgende Bemerkung:"Nota. Kaiser Franz II. hat die teutsehe Kaiserkrone den 6. August 1806 abgelegt; den 9. August wurde es am Eeichstage zur Dietatur gebracht, und den 18ten nemlichen Monats ist das Kammergericht nicht mehr aufgegangen." Das Kammergericht ist somit gleichsam als gestorben registrirt. Der Reichskanm1ergerichts-Sekretar A. M. Wallreuther ist gestorben nach dem Verzeichniss der beim Reichskammergericht gestorbenen Personen am 17. Mai 1831 (dort wird er als Notar bezeichnet), nach einer anderen Notiz hinter seiner Silhouette, die zufallig in des Verfassers Besitz gelangte, am 7. Mai desselben Jahres. Wigand arbeitete bereits seit 1830 an der Ordnung des Reichskammergerichts-Archivs in Wetzlar. October 31, 1767, --ilain Pro-lam. Disp. D Franciscus Leopoldus Wolff Cin-- Aul. Dmi Marchionis Paroc-is A - - D Parocho -asladiens disnihub ??? A. M. Francisca Wallreuther Benedixus _ R. D Wallreuther ecel Coll. P. V. Can testes D Wigand et Par j. Boller. Note: May be the daughter of Michael Anton Wallreuther. He was in Worms. The tombs of Johann Anton Wallreuther and his nephew Peter Fredeich Wallreuther contain a family crest or coat of arms. 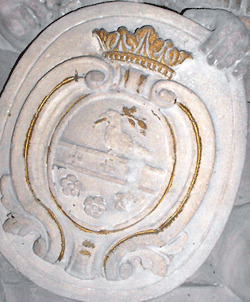 The crest on the tomb of Johann Anton Wallreuther is colored. The coat of arms is a medallion divided in two fields by a band of gold. In the top half of the medallion is a bird of some sort, looks like a seated dove with a olive branch in its beak. (May signify the holy spirit.) In the band are three black crosses with equal arms. In the lower portion of the medallion are three white flowers each containing four or five pedals with a black center. The medallion is topped by a five point gold crown. Joachim Specht suggests that the crown could indicate that the family had been knighted. German book-plates: an illustrated handbook of German & Austrian exlibris By Karl Emich Leiningen-Westerburg (Graf zu) Book Place of D. Michale Schnock von Kiederich, Abbot of Eberbach (17..), MDCCCCI (1901), University of California, Google Book. All records for Wallreuther in Kiderich are form LDS microfilm #1270396 unless otherwise noted. Kiedrich is know for its Riesling wines. All records for Wallreuter in Herrnsheim are from LDS microfilms 0958790 and 0958791 unless otherwise noted. Several of the baptismal records indicate some connection to Worms. St Pauls Church Worms - where Philipp Franz Wallreuther was canon in the early 1800s. Beautiful pictures - Text in German.